Tag Archive | "Donie Allington"
“Modern” Woodmen lodge members help an ill neighbor (Burch), in potato harvesting at Solon Center, circa 1915. Back row (L to R): Charley Terrell, Walter Spathe, Emmory Goodell, Alvin Heiss Sr., Guy Eyers, Ray Bloomfield, Sherm Smith. Front row (L to R): Chauncey Weller, unknown, Berny Goodell, Ira Goodell or Gerald Bloomfield, Morgan Smith, Glenn Heiss, Ernest Weller, Denny Noonen, Alvin Heiss, Jim Bloomfield. Last week we printed a photo belonging to Donie Allington, 81, of Solon Township, and submitted by her son, Len. We asked if anyone knew anything about the photo or the people in it. 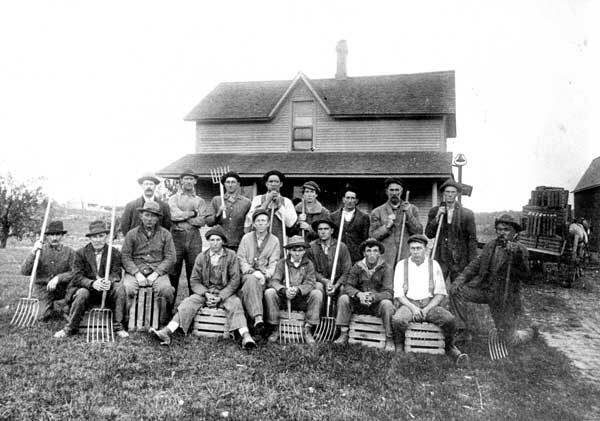 Donie knew the men were Modern woodmen lodge members helping a neighbor dig potatoes, and that one of the men in the photo was her grandfather. Imagine our surprise when Gail and Herb Merlington came in this week with a Post from 1993—a Post where we had not only printed the same photo, but had all the names (or most of them) as well! It turns out that Gail saved that Post because not only are both her grandfathers in the photo, but she also grew up in the house that was pictured. Located south of 19 Mile, on the east side of Algoma, the house is still standing today. “The porch is now gone, but that window on the front is still there,” said Herb. Gail lived in the home from the time she was born, with her parents, Sue (Magoon) and Robert Champlin, until she and Herb, who moved up from Lansing, were married, in 1963. Gail graduated from Cedar Springs High School in 1961. She said she remembers her grandfather, Sherman Smith, living with them. She also said that her other grandfather, Charley Terrell, lived in the house on the northwest corner of Algoma and 19 Mile, and had a general store next to the house. Both Charley Terrell and Sherman Smith are in the photo. The photo in the 1993 edition appears to have been printed in courtesy of the Cedar Springs Historical Society. Donie’s grandfather, Chauncey Weller, is indeed in the photo, as was an uncle, Ernest Weller. The picture says it was circa 1915.